Our platform combines breakthrough novel biology with proprietary analysis software that runs in a big-data cloud architecture. Compound libraries are screened in a purpose-built, high performance Translation Control Lab. 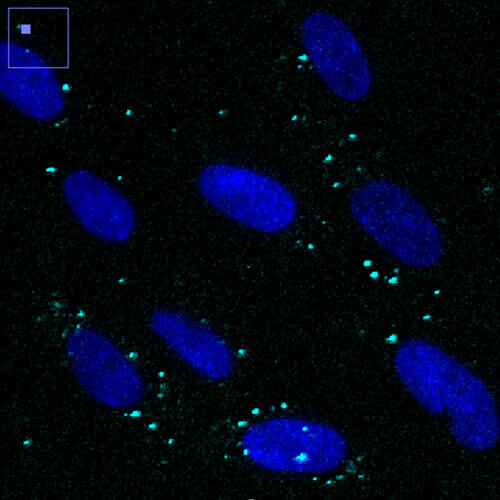 Using our protein synthesis monitoring assays, we generate millions of images that show the impact of the different compounds on the translation of the target protein. Images are uploaded in real time into the project’s private cloud where they are analyzed by our proprietary bio-informatics, imaging and big data analysis algorithms to identify hit molecules that selectively control the translation of the target protein. Analysis is done in several iterations by applying multiple secondary assays built around our technology. We analyze the impact of hit compounds on overall protein synthesis, eliminating compounds that are toxic, that interfere with the synthesis of many of the cell's proteins or that shut down the translation machinery itself. Additional translation selectivity assays were developed which monitor the effect of compounds on groups of proteins of interest or specific proteins along a pathway. The platform verifies the selectivity of hit compounds and offers unique analysis capabilities that assist in optimization, target de-convolution and mechanism of action identification. The full repertoire of human tRNAs (48 isoacceptors) has been affinity purified and labeled with a fluorescent tag using Anima’s patented technology. Two complete tRNA libraries have been designed: one tagged with an energy donor and one tagged with an energy acceptor. To monitor the translation of any specific protein, we select the “signature pair” of that protein, selected by our tRNA bioinformatics. The process is patent protected. Using FRET signals from signature tRNA pairs of the target protein, one tRNA of the pair is labeled with an energy donor, the other with an energy acceptor; we visualize and monitor the target’s translation. Anima’s PSM technology can monitor global translation within cells, providing spatial and temporal resolution. Translation of cell surface receptors is monitored on the Endoplasmic Reticulum (ER) or in the cytoplasm; in neurons translation is monitored at the cell body, in neurites or in axons. In addition to translation, tRNA transport along dendrites and axons may be monitored. Spatial resolution allows us to study the local translation response to signals at the synapse. Single proteins or proteins belonging to the same family, or process, can be monitored by using a specific pair or pairs of tRNA. Thus, coordinated translation of proteins in response to external signals can be studied. The response of translation to regulators found upstream to biological process can be studied, for example inhibitors of mTOR or MAPK. Post-transcription to translation regulatory mechanisms are novel targets that can be targeted with our technology. 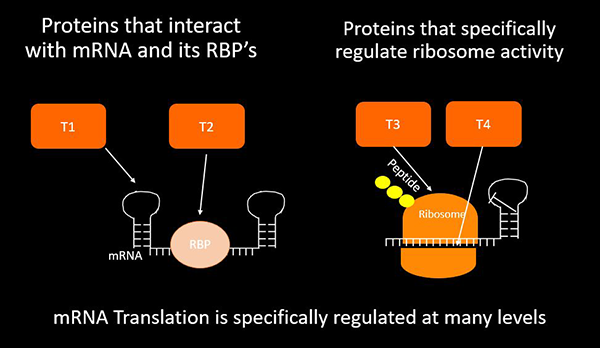 These include among others proteins that interact with the mRNA and its RBP’s (RNA Binding Proteins) and proteins that specifically regulate ribosome activity. Our platform discovers molecules that target these regulatory proteins and pathways. PSM not only identifies drug candidates but intrinsically helps in elucidating the pathways and mechanism of action of these molecules. Our tRNAome bioinformatics identifies a unique tRNA pair that repeats at high frequency in the target protein’s sequence but is not frequently used in the background human proteome. Amazingly, 83% of known proteins have a tRNA pair with a repeat factor of 30 or more against the average background. When the selected “signature” pair is used in the screening system, a light pulse (FRET) is generated whenever the pair sits in a ribosome. This will happen at high frequency for the target but not for other proteins, enabling us to visually see the target protein’s translation. We can see when, where and how much of the target protein is being made in the cell, in real time. 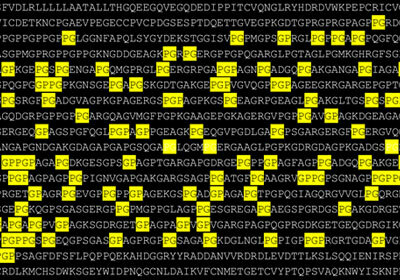 To monitor overall protein translation, all 48 types of labeled human tRNAs are used in the screen. This generates a light signal on each and every pair, creating a fascinating light map of the overall protein synthesis in the cells. The combined use of total tRNA and specific pair of tRNA enables differentiating global translation inhibitors and specific ones. Only compounds that show activity in inhibiting the translation with the target’s specific tRNA-pair but do not show activity on global translation (measured with total-tRNA) will be selected for further analysis. 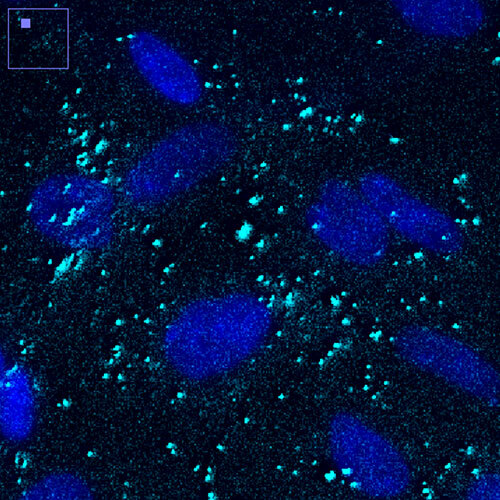 Our proprietary image analysis extracts a large set of features from the millions of images of protein translation. Each feature represents a meaningful biological information item that is used in the generation of a translation signature profile. In the image: Each cell population define a volume in space. This multi-dimensional approach allows us to point out possible hits regardless of their distribution. Anima's cloud-based system is hosted on Amazon (AWS) in a private secured zone, using the highest security, access control and data recovery standards. The platform implements an end to end, fully automated screening and analysis process: Plate data from screening machines is uploaded to the cloud in real time. Proprietary big data analysis algorithms analyze millions of images and billions of data points to identify compounds that are active as translation modulators of the target protein.